This microscope arises on a very short single pillar with small uprights at its top, much like the Biological models, but much shorter. A black-painted, equiaxed flat tripod supports the pillar. The remainder is of polished brass. It has a round but fixed stage, with Bulloch's typical damascened type of finish, which can accept clips, or as an option the gliding stage slide-carrier as shown here. The slide carrier differs from those seen with the more expensive Bulloch models. Instead of being held down by an ivory-tipped prong from above, it is held down by its two springy brass extensions which grasp the stage from the underside. This slide-carrier rides on four ivory prongs on the top of the stage, and two on the bottom, one built into the thicker tip of each of the the springy brass supports. A small projection of the left side of the carrier serves to register the left side of a slide. There is a shallow dovetail slot machined into the underside of the stage to accept substage apparatus, which would have slid in from the front to back. 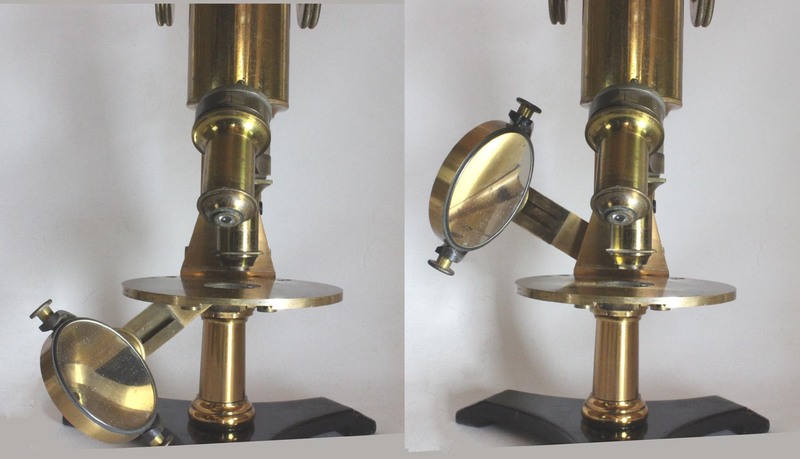 The stage is supported by a saddle, isolating it from the movement of the swinging tailpiece, making it the cheapest of the Bulloch microscopes so equipped. This saddle fitting screws into part of the brass of the fine focus casing. 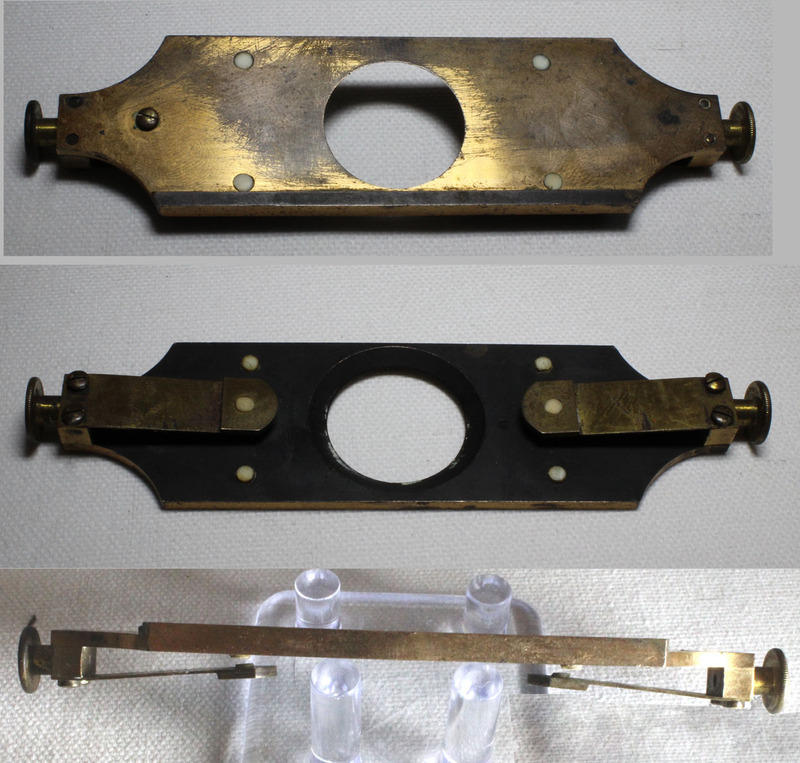 This part of the casing, to which the saddle is attached, is separated from arm movement of the fine focus by a vertical slot cut into the brass. These fittings are all made with high stability and precision and there is absolutely no vibration or 'play' in the stage or arm as a result. The mirror can be adjusted up or down on its zig-zag shaped tailpiece, and has both a flat side and a concave side. One major difference from the Bulloch Histological model in that there is no provision for a condenser fitting on the tailpiece. Coarse focus is by straight rack and pinion, fine focus by very fine threaded screw acting in the stem. The main optical tube is five inches long, excluding nosepiece and ocular. There is a long draw tube, equal in length to the main tube, and at its lower end is a threaded fitting which could accept an erecting lens, or other apparatus. There is a good double nosepiece, 2 objectives and a single ocular but no case with this example. The objectives are of lower and higher power but are unsigned. The microscope is notable for the lack of a serial number anywhere on the instrument and also for the location of the signatures of 'W. H. Bulloch, Chicago, Ill.' on the right side of the arm, and 'Meyrowitz Brothers, New York' on the left side of the arm. These are each nicely stamped in block letters. 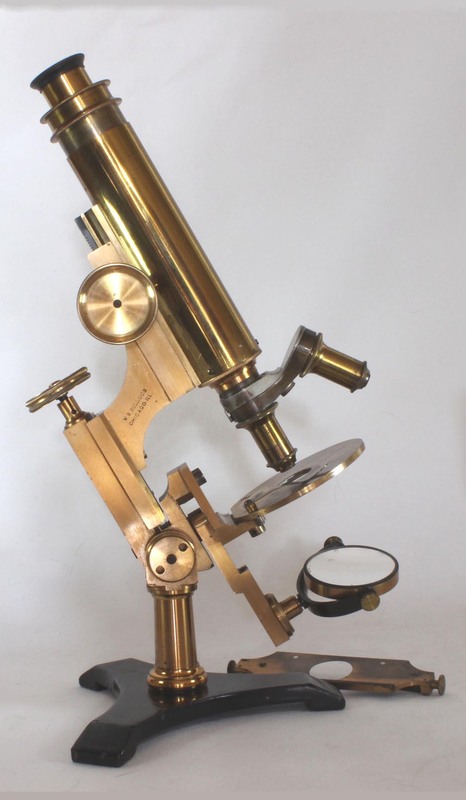 This is a very well-made microscope; the precision and adjustments of the fine focus being particularly notable in this regard. The stand shown here is the only example of this exact model that I have seen. This instrument, apparently the second of three or four known 'student' designs by Bulloch, is not listed in the 1878 catalog, the 1890 catalog or the 1879 list from Frey. The only engravings of it appear in the English translation of 'The Microscope in Botany' by Behrens, published in 1885 and in an advertisement in 'The Microscope, an Illustrated Monthly Journal' from the same year. In that ad, the microscope retailed with an eyepiece and case, but no objectives for $30, with objectives $50-$60; the 'sliding object carrier' was an extra $3.50. 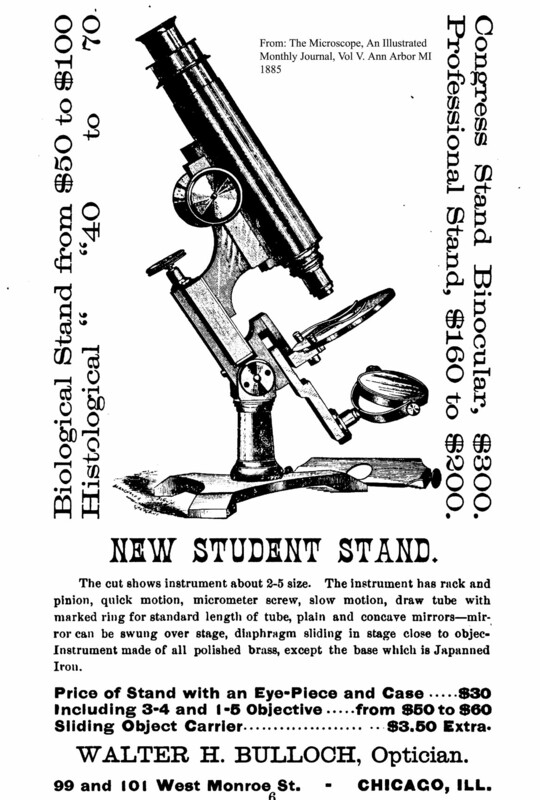 By the 1890 catalog, the Student microscope was a much simpler and cheaper model (see the Bulloch Microscope Evolution Page for more details on various models). Walter H Bulloch was born in Scotland and emigrated with his parents to New York as a teenager. He was soon apprenticed to Benjamin Pike and Sons where he learned the art of fine machining (and apparently microscope design). According to Bulloch, as reported in a Presidential address in the Proceedings of Microscopical Congress of 1878, he worked for Pike 'continuously' from 1853 to 1864.. He soon joined in partnership with the famous objective maker William Wales, who made objectives, selling his stands with Wales objectives, and worked with him from 1864, moving to Chicago in 1866 and making his first stand solely of his own manufacture in Chicago, in 1867. Despite the apparent work with Wales, stands by Bulloch from that time, before his move to Chicago, have not yet been identified. 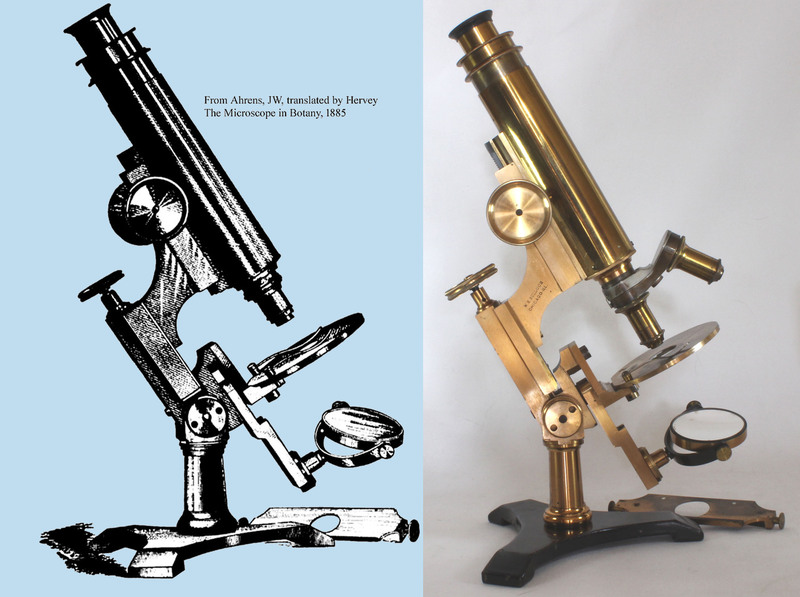 The reason for this is likely that they were not signed; unsigned Bulloch microscopes from his later productions have been identified because of certain features, but since his early designs have no frame of reference there is as yet no way to identify them. Although he initially prosperred in Chicago, the Great Chicago Fire of 1871 destroyed his premises and he never completely recovered from this loss. To the best of my knowledge, microscopes dating from this early period in Chicago (1867-1871) have also not been firmly identified. Following the 1871 fire he left Chicago and went to Boston to work with the famous Robert B Tolles, inventor of the oil-immersion objective. He was back in business in Chicago by 1872, and stands dating from about 1875 have been identified. As is evidenced by a signature on stand number 77, his agent in Chicago in that era was T. F. Nelson. T.F. Nelson apparently declared Bankruptcy in 1879 according to the Chicago Daily Law Bulletin, volume 25. A 1879 patent is for features of his design used on the Professional, Biological, and 'A1' Congress stands. His design for the Congress stand was published in the Journal of the Royal Microscopical Society in 1880 and the improved version, starting about 1882 as is pictured and described on this website here. Bulloch was elected a Fellow of the Royal Microscopical Society in December of 1882. In 1889 he again left Chicago for a brief time working for the U.S. Geodetic Survey as part of the Bureau of weights and measures but he again returned to Chicago after only six months with the Survey group. In the Microscopical Bulletin and Science News of December of 1890, it states that Bulloch 'has given up the manufacture of microscopes in which he was engaged in Chicago and has accepted a position in the Coast Survey'. Nevertheless. in 1891 he opened business again in Chicago, but had longstanding bad health and died in November of 1891. For a few months after his death, a M. Von Mehren took over his business but his entire business was shortly then taken over by the 'opticians' E.B. Meyrowitz of New York City, (who were his New York agents even well before his death), and several surviving instruments have the Meyerowitz signature on the foot and some have both Meyrowitz and Bulloch signatures. As noted above, there is no record known to the author of Bulloch ever making his own objectives. However Bulloch made impressive stands, especially his Congress stand, the Professional, Lithological, and the Biological Number 2. There are at least four different versions of the Bulloch Student microscopes. 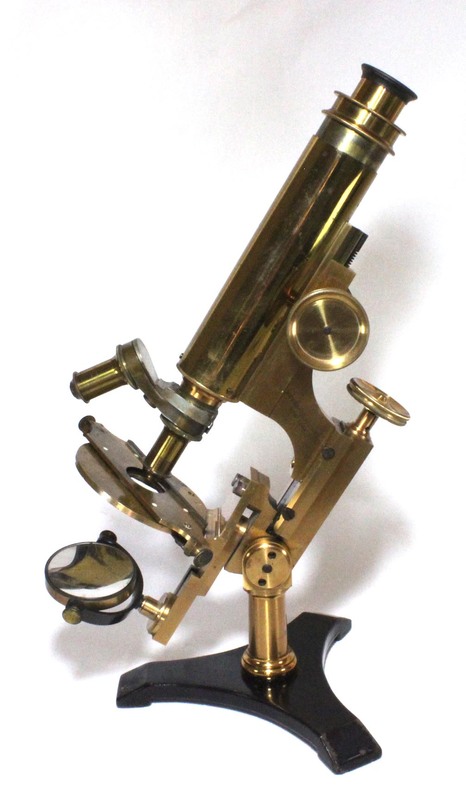 The 'New Student' microscope of about 1885, shown on this web page, was one of these. Bulloch made relatively few stands compared to many other well-known makers. This is in part due to the limited time he was in business, and the fact that he was a perfectionist. Anyone who has had the priviledge of handling Bulloch instruments cannot help but admire his quality of workmanship and his very sound designs. For a table listing Bullochs locations and workplaces see the Bulloch Chronology Page.A webpage devoted to a chronological review of Bulloch microscopes, utilizing both engravings and actual images (where available), can be seen here. The author would like to acknowledge the help of Alan Wisner, Paul Ferraglio, John P. Trier, Joe Zeligs, and others who have helped clarify several issues as well as help me realize some errors I had first made when preparing this page. I am always greatful to all my good friends in the microscopy world who share their knowledge and keen powers of observation with me. I would welcome further input from any reader as well.